Transparency Market Research (TMR) has published a report, titled “Roofing Market - Global Industry Analysis, Size, Share, Growth, Trends and Forecast 2014 - 2020”. This is a comprehensive market study that presents key insights into the growth drivers, restraints, and future outlook of the global roofing market. Based on in-depth market surveys, the report pegs the overall value of the global roofing market at US$64.5 bn in 2013. Rising at a positive CAGR of 6.30% between 2014 and 2020, the market is likely to reach US$97.6 bn in 2020. The report states that the roofing industry will benefit considerably from the expanding construction industry, especially across the emerging economies of Asia Pacific and RoW. 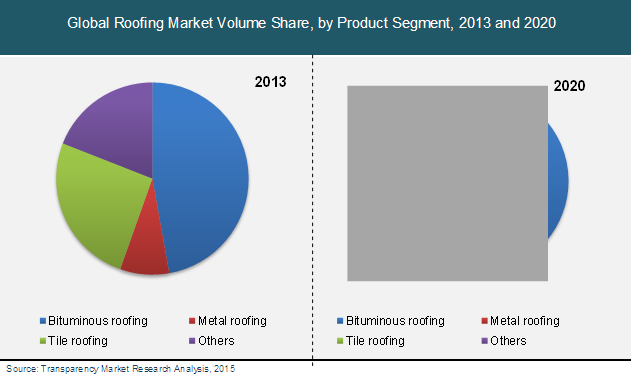 The thriving re-roofing market in Europe and North America will also fuel demand from the roofing materials market. Research and development activities are identified as vital components propelling the roofing industry. With major players in the market proactively funding ambitious research and development initiatives, the demand for roofing materials is poised to rise exponentially in the near future, states the report. Furthermore, government institutions such as the U.S. Environmental Protection Agency (EPA) and others identify the usage of roofing materials to be in coherence with environmental laws. The global roofing market, therefore, holds immense potential for future growth. The report presents a 360-degree snapshot of the prevailing market dynamics to update stakeholders about the potential growth trajectory of the market during the forecast period. For the purpose of the study, the global roofing market is segmented on the basis of product type, application, and region. In terms of product type, bituminous roofing emerged as the most preferred roofing material due to its waterproofing ability and pocket-friendly pricing. The segment accounted for over 45% of the global roofing market in 2013. These roofing materials find extensive usage particularly in schools, offices, retail stores, and hospitals. Tile roofing, according to the report, emerged as the second largest segment in 2013 due to its increasing usage, particularly in Asia Pacific economies such as India, Malaysia, Taiwan, and Indonesia. “Among tile roofing materials, concrete emerged as the most preferred type,” said a lead TMR analyst. The report states that nonresidential construction emerged as the largest application segment, accounting for over 40% of the global roofing market in 2013. Rising investment in infrastructural development is fuelling nonresidential constructions such as office buildings, healthcare centers, amusement and recreational centers, and educational institutions. Asia Pacific, according to the report, exhibited the highest demand for roofing, accounting for 40% of the global roofing market in 2013. The market for roofing in Asia Pacific is gaining much traction from the increasing investment for infrastructural development in industrial, commercial, as well as healthcare sectors. While the Rest of the World (RoW) region is also exhibiting a positive growth curve, the presence of large industries boosts demand for roofing materials in the North America market. To present a holistic report, the report also studies the vendor landscape of the global roofing market. It therefore profiles companies such as GAF Materials Corporation, Johns Manville, Braas Monier Building Group S.A., Beacon Roofing Supply, Inc., IKO Industries Ltd., CertainTeed Corporation, and Owens Corning.